come on -- give me a break. I am not a troll. I have had a c4zr1, c6z06, and now a c7z06 we call Miss Piggy. Just putting a little healthy debate out there for all us prideful C7Z06 owners that are proud of the 650/650 badge on the console. Even had a C2 and a 1990 c4 with an L98 with a whopping 225hp(What a dog that thing was) Stock -5.0 mustangs of the day would blow the doors off that thing back in the day. c4zr1 great car. No complaints- bought this one used. No problems. . C6z06 great car no complaints for the most part. Just the valve guide concern. Your correct l98 in the vette 245 horse. I was recalling the same motor as installed in the camaro and trans am gta was 225 hp. honestly I think I know what his deal is. he actually loves his car. But maybe where he lives or the people he hangs out with hates his car. So what he does is play that role of hate online in order to inherit any defense made for the car that he can use in his personal life. 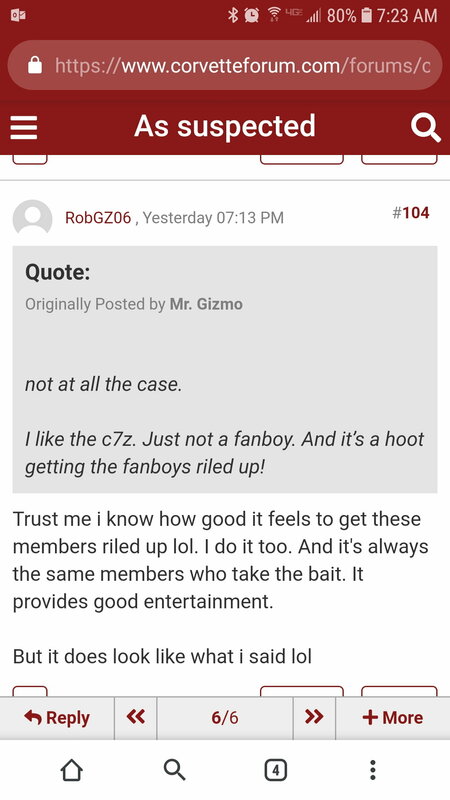 he might not have known all the "facts" about the c7z vs the c6z so in order to get those facts so he can use it in real life, he has to play the villian here. not at all the case. I like the c7z. Just not a fanboy. And it’s a hoot getting the fanboys riled up! I don't really have a dog in this fight (C6 vs C7 fanboydom) as I've never owned a corvette before the C7. What I will say is that I was a HUGE mustang fan up until 2016 when I bought a Z51. I'd seen plenty, and been in a couple of corvettes before then and i wasn't THAT impressed. I've been in the C6 and my neighbor had a C6 Z06 and took me for a ride and I thougt "eh, it's a little faster than my (at that time) 2013 mustang, but not at all worth twice the price". The interior of the C7 beats the PANTS off the C6. There's no comparison and ANYONE that says the C6 is better in that regard is being a straight up hater. Now my Z51 wasn't much faster than my mustang and after a year and a half, I upgraded to a Z06 and I've never looked back. This is BY FAR the fastest car I've ever owned or even been up against. I've raced C6 Z06s (2, to be exact) Tesla P100DL, a GTR, and really nothing can beat it (and I have the M7, not the A8). I'm nothing NEAR a fan boy (at least of a corvette, but maybe mustangs) and I think that the C7 Z06 is more than double the car that the C6 Z06 is. between the styling, the interior, the tech, AND the speed, it's just a hands down far far superior car. Sorry Gizmo, you're on your own here. Trust me i know how good it feels to get these members riled up lol. I do it too. And it's always the same members who take the bait. It provides good entertainment. thanks for sharing your inner thoughts with all of us. if there were ever any questions as to the status of happiness and fulfillment in your lives I believe they were answered in the above replies by none other than yourselves. ps. Thanks for edging the Corvette forum 1 step closer to other once great forums like Tech and TBSS owners lol. ^^^^^if it doesnt translate well, yes that is sarcasm. 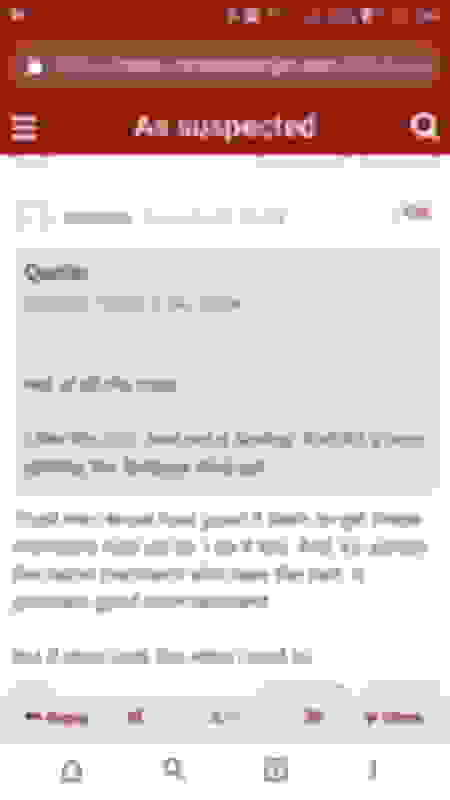 Last edited by 16/C7Z; 11-17-2018 at 07:24 AM. lol! I like the car. but am of the opinion gm gypped us just a little bit on the supercharger or their engine design team was a bit inept on this aspect of the car —. maybe their goal was an a8 quarter mile queen. Very impressed with that and maybe that’s where the 1.7 shines. Last edited by Mr. Gizmo; 11-17-2018 at 11:20 AM. lol! I like the car. but am of the opinion gm gypped us on the supercharger or their engine design team was a bit inept on this aspect of the car —. maybe their goal was an a8 quarter mile queen. Very impressed with that and maybe that’s where the 1.7 shines. They had the goal of 650 HP and the 1.7 was good for that. If one wants more we upgrade. Love my C7 Z06. It does just what it was designed to do at a bargain price. Sounds like y'all have mental health issues. Last edited by Warp Factor; 11-17-2018 at 04:56 PM. I love my car but I'm not biased. Most car owners are biased to the cars they own, for obvious reasons. Whatever car someone owns, that's the best car lol. our cars have many flaws and that's what people dont want to admit so they go around it justifying why it's made like that. I actually like a lot of cars. But I been a fan of the Corvette since high school. That's why I owned 2 of them. But i dont think it's the best car ever. quite sure I can beat anything less the very top cars such as the 720s ETC. Going to shoot for 9's and 140 trap speeds this spring. Nothing close for the money PERIOD! Last edited by 3 Z06ZR1; 11-17-2018 at 01:38 PM. Ehh i don't even know if it's the best car in the price range. Other cars to consider is the ZL1, the GTR (although not a nismo) and a CTSV (not brand new of course). It seems to me that the ZL1 is a better engineered car than the z06, which in the long run if you think about it, faster. Especially if you go auto. It has a better auto with the 10 speed, better cooling which means you're not going to lose power as the car gets put through the abuse. Although the z06 IS the best looking car out of the cars i mentioned so that's an advantage the corvette will always have. But those other cars i mentioned are no slouch. If i had to do it all over honestly, i probably would have gotten the CTSV instead of the C7Z, because i am getting older lol. And then just wait for the C8 to come out. But everytime i see a GTR, i'm like damn, imagine if i got that instead lol. After i drove one, i was hooked. Instant traction, instant power, INSTANT shifts. GM better have a dual clutch in the C8. It's a must. No more tooling around with the slow *** slushboxes. Last edited by RobGZ06; 11-17-2018 at 02:30 PM. I personally like many cars as well. The Z06 isn’t the best. It’s THE best car in the price range. If one wants a better car they need to mod it or spend more money. Very simple. yes it is and pretty reliable too - especially for a guy like me that wants a toy but doesn’t want to part with a ton of money. I've owned a number of muscle/performance cars in my nearly 70 years and my Z06 is without a doubt one of the best I've ever owned. Yes, there's probably room for improvement, but I think that's the case with any car. I don't consider myself a Corvette guy. I'm a car guy. I don't care if it's made here or anywhere else, if it goes fast I like it. If you don't like it or or think there's something better out there, go buy it. CW4L Black Friday Forgeline Sale, You Pay What We Pay!! !